I’ll admit, before I saw the first Sherlock Holmes film, I was a bit skeptical. I was unsure of how Guy Ritchie would portray Holmes, given his filmography. In the novels, Holmes was skilled as a pugilist and excellent at weapons handling, but it was far from a focal point. Fortunately, Ritchie realized this and, although the first film contained quite a bit of action, it was tempered with the excellent portrayal of Holmes’ observational ability and intelligence. Fortunately, he keeps this portrayal in the second film, A Game of Shadows, and I’m happy to say that as a fan of the first film, I thoroughly enjoyed the sequel, perhaps even more. Those of you who enjoyed the action interspersed with the “How the hell did he figure that out?” moments in the first film will in all likelihood feel the same. The film opens with Holmes (Robert Downey, Jr.) tracking down Irene (Rachel McAdams), his love interest from the first film. He successfully foils an assassination attempt on the Crown Prince of Austria, only to later find him dead from poisoning. Irene, who was supposed to deliver a message to Professor Moriarty (Jared Harris) but failed, is killed before she can meet Sherlock for dinner that evening. Meanwhile, Holmes and his brother (Stephen Fry) take Watson (Jude Law) out to a gentleman’s club for Watson’s bachelor party, where Holmes prevents the murder of a fortune teller named Sim (Noomi Rapace). Eventually, it is revealed that her brother is part of a conspiracy with Professor Moriarty to ignite a global conflict, and Holmes, Watson, and Sim must work together to prevent the conflict. Once again, the production values are top-notch. The effects are outstanding, and the cinematography is top-notch. One chase scene in particular while Holmes and crew are attempting to catch a train ranks among one of the better action scenes in a film I’ve seen this year. The acting itself is decent, but it isn’t going to garner any awards. Downey and Law have a solid on-screen chemistry, while Fry does a terrific job as comic relief (one scene with his aged manservant was particularly hilarious). The film itself presents a good balance of humor and action but is remarkably bereft of any languish, surprising given the amount of death in the film. Perhaps Ritchie did this intentionally to keep the film lighter, but given the title, that’s a specious assumption. Irene’s death barely seems to nudge Holmes. If there’s any complaint I had about the film, it’s that Holmes’ brilliance becomes just a little too predictable. Several times in the film, he appears to be outwitted, but it never really seems so, because the viewer just knows Holmes already thought of the scenario and has already taken a course of action to turn the probability in his favor. Part of the appeal of the first was the brilliance with which Holmes reaches his conclusion, and these scenes are included quite frequently in the second film. They’re still pretty awesome to watch, but by the end, they almost lose their effect. Eventually the viewer realizes that anything they see in the first half of the film becomes a Chekhov gun, and I kind of wondered if the film was becoming too clever for itself. Still, I can’t deny that I thoroughly enjoyed the movie. It’s witty, action-packed, entertaining, and damn if I didn’t want to be like Sherlock Holmes. Fans of the books will also quickly realize that the ending of the film is highly influenced by one of the books. I won’t mention which one, because it would spoil the ending; regardless, it’s well done, and people who enjoyed the first film should enjoy the second one. 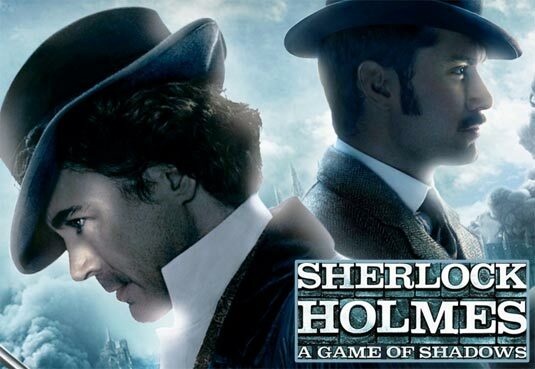 Sherlock Holmes: A Game of Shadows gets a B+.